the Keitai Goddess : Please snot at home? Subway manner poster telling people not to litter. Given that there is never litter it is hard to know why they needed to make a poster about this. I would love to be a fly on the wall during the planning meetings for these posters. Some of these posters have been hilarious but not in the way I think the planners want. How did get a photo of the snot poster before the first working day of the month? We were out and about on the subways yesterday and they were everywhere. Kristen, Do people really send complaint letters to the Metro about stopping other passengers doing their makeup and carrying big backpacks? Wow there are some uptight travellers out there!! I dunno, but this seems a little more specific than some of the previous posters in the campaign. I guess the idea is “please don’t blow your nose, drop the tissue on the floor, and stick the tissue to the seat using your shoes”. Right? 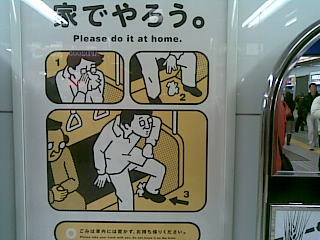 I wonder if it’s acceptable behavior if you change step #3, for example, and stick the tissue between the cushions of the seat. Hmmm..